The material we used 14.6OZ PVC tarpaulin which mesh reinforced inside and both side PVC coated.It is UV resistant and flame retardant. Here is the sketch for your reference. We made lots of D-rings on the body and bottom of tent for ground anchoring. The are 2 openings in both end curtains.All openings have ability to be closed and opened when needed. 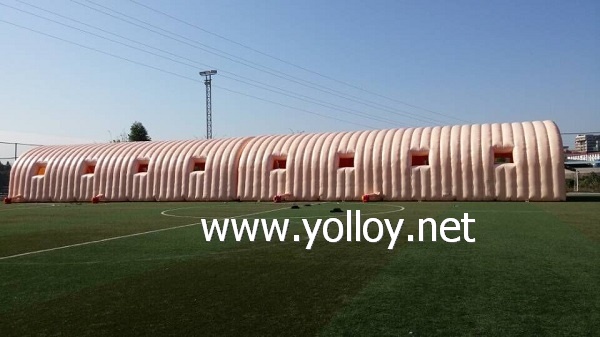 Both sides of shelter with zipper curtain.You can take off it according to your requirement.